Although I get quite a few compliments from makeup artists and friends about my skin, I'm not immune to the occasional blemish, especially around that time of the month. To the rescue: the newest product from LUSH, Grease Lightning ($12.95) is a gel formula meant to zap blemishes and absorb excess oil. Antibacterial ingredients like tea tree oil, thyme, and rosemary shrink zits. Meanwhile, lavender oil regulates oil production, green grape juice gently cleanses skin, and aloe vera soothes inflammation. So, how does Grease Lightning measure up? Surprisingly, the bevy of natural ingredients does an admirable job of keeping sporadic breakouts under control. It visibly shrinks zits overnight and takes away some of the inflammation and redness. Since I use it as a spot treatment, the 1.5 oz container is more than enough. I also like dabbing some on congested pores around my nose and cheekbones to clear them up gradually. Overall, I'm impressed enough to keep Grease Lightning in the medicine cabinet for the rare skin emergency. ah! thank you for posting this. 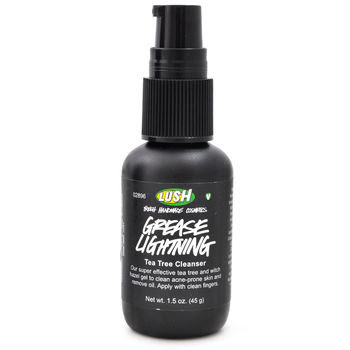 I have grease lightening too but no idea how to use it. it seems too watery for a spot treatment and so much comes out in one pump, so i've been confused as to what exactly i should do with it. i like the idea of dabbing on the nose, i'm going to try that. thanks lisa! Weird! I found the consistency to be pretty gel-like, not very watery at all. And if I only wanted a tiny bit of product I didn't press down on the pump all the way. Hm very interesting. Will definitely keep in mind ! And yes you have amazing skin!! I love Lush! Especially Ocean Salt as a body scrub. I am a huge LUSH fan. I really like their bath bombs and their body butters. I have also tried their face masks. I think Grease Lightning would be great for me because these days, I keep breaking out. For now I am using straight up tea tree oil on my zits.